I have around 1TB of flac’s in my library and I have started the painful process of uploading these things to the VOX cloud. A little while ago I noticed that it stopped uploading, and said that it was complete. I scanned through my music and 2/3rds of it are missing. Odd. I checked the drive where it was uploading from, and the files are there. Even more odd. I added the folder where they are located to the watched listing and now it’s duplicating my tracks. How can I get rid of these duplicates and get my other tracks uploaded. This is incredibly annoying. Please someone give a real solution to this and not some BS answer. I am running the most recent version of VOX on my Mac and iOS devices as well. I have had this same issue from day one. Random tracks will not upload correctly. This happened for me with the web upload tool and the VOX app. What is odd about this problem is that if you upload using the vox tool and it doesn’t upload successfully, it will show the offending track in a dim gray color at which time you can either delete the track or the entire album and try uploading again. Many times when I try either process it takes a few attempts before the track successfully uploads. And if you delete the entire album and reupload, other tracks will exhibit the upload issue. I don’t have quite as much music as you do, roughly 500GB of FLAC files, but I encountered this issue numerous times and wasted a lot of time trying to get files to successfully upload. It’s incredibly annoying! Now my Mac shows them normally (no duplicates) but on some albums on my phone, it’s duplicate city! Can you indicate some particulart tracks\albums so we can see if duplicates are there on the servers? Did you try to re-loing using your iOS device? Are duplicates are still there? I deleted the app and reinstalled. When you go to any album that had a duplicate, it will show them and then they disappear. Not sure if that’s normal. I will write back if I find more. Does it auto delete duplicates? Blake Shelton’s BRING BACK THE SUNSHINE. 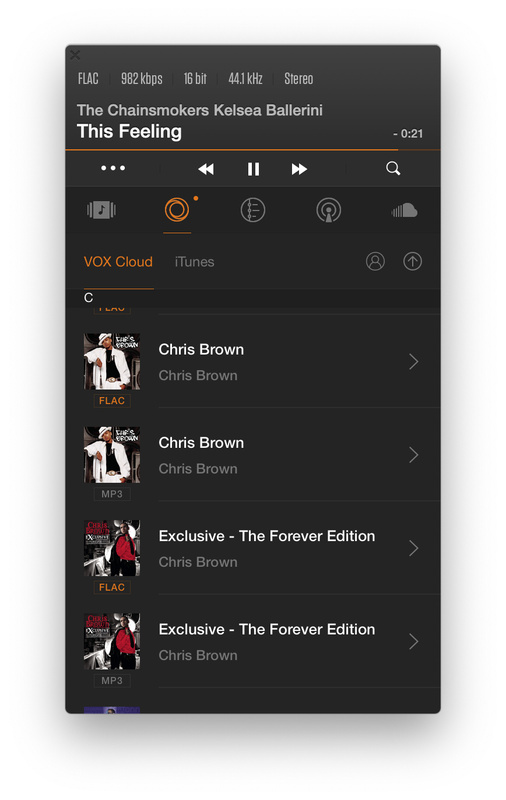 I’ve just signed for a 2y premium subscription and started to upload some music to the Vox Cloud. The first folder I’ve uploaded from my HD is given for 69 GB. After all the upload process, I could only see 59-60 GB in the cloud, and a couple of tracks were missing. I have then added this very folder to the Watch folder list in the MacOS app. I now have 121 GB of files online: more or less all of the albums/tracks have been uploaded a second time. Is there any way to clear the cloud from all the files? I’m willing to start from fresh again.